Welcome to the West Virginia State Bookstore. We're glad you stopped by and we hope that you find exactly what you're looking for. Shopping categories include books about West Virginia people, books about West Virginia History, West Virginia Cookbooks, Hiking and enjoying the West Virginia outdoors, West Virginia reference books, and calendars, magazines and newspapers, DVD and videos, and posters under MORE. 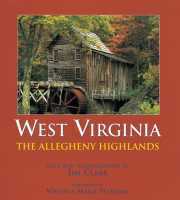 In The West Virginia State Bookstore you will find information about West Virginia for readers of all ages. Age ranges for books for young readers are highlighted in red. Have fun. Nestled in the eastern reaches of West Virginia lies an area of exceptional scenic and natural beauty: the Allegheny Highlands. Just an easy day's drive from 20 major eastern cities, the Allegheny Highlands is the largest single natural scenic and outdoor recreational area in the eastern United States. The highlands covers over 11,000 square miles of hardwood forests, wind-swept mountain ranges, cascading waterfalls, and picturesque valleys. Writer/ photographer and wildlife biologist Jim Clark is a native of the area, and he pays tribute to the natural beauty of this region season by season.